Would you like to experience calm and luxury? To relax beside the swimming pool, or explore the beauty of the Dordogne? La Douce Dordogne is the ideal place for a wonderful holiday. A contemporary chambres d’hôtes in the heart of the Dordogne, in the Le Périgord Noir region with its rich history. La Douce Dordogne is a chambres d’hôtes (bed & breakfast) with five ambient rooms. Each room boasts a stylish and modern interior and is equipped with all conveniences. In addition, you may use the swimming pool, Jacuzzi and sauna. All with a stunning view and a glass of fine wine. Now that is what we call pleasure. Le Périgord Noir in the Dordogne is home to the Pécharmant, Saint-Emilion, Pomérol and Cahors wines and many sociable terraces. You can sample exquisite French cuisine in the many ambient restaurants. In addition, the region is known for its authentic medieval villages and prehistoric cave paintings, such as those in Les Eyzies and Tursac. The scenic hills, meadows and woodlands are ideally suited for walking, cycling or mountain biking excursions. Cleary recognisable routes have been demarcated for this purpose. Why not spend a day horseback riding or canoeing on the Vézère? One thing is certain: there is always something to do in Le Périgord Noir. 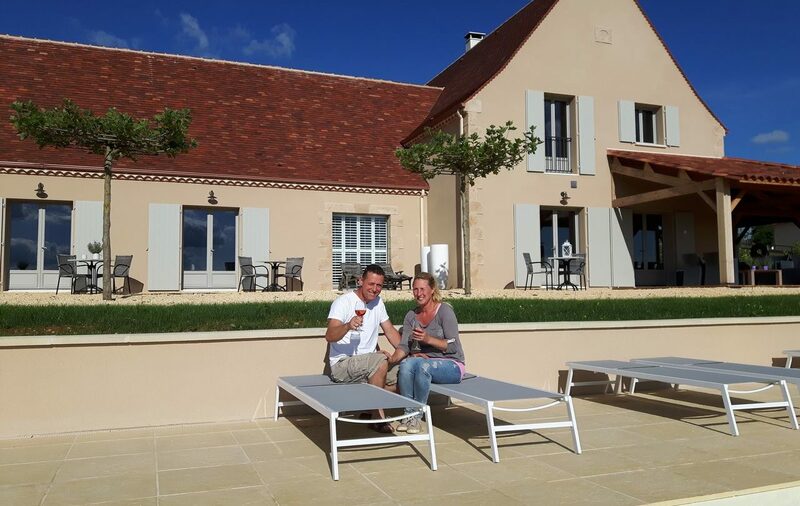 Edwin and Mariëlle van Zutphen look forward to welcoming you in their chambres d’hôtes.